Archery GB’s Graham Potts will be heading to the Olympic Games in Rio this summer after he was named chairman of the International Technical Official team. As lead judge, Graham – who was a part of the judging team at London 2012 – will ensure safety and fair play at the Sambadrome this August. Kudos: What was your first exposure to archery and how did that lead to a permanent interest in it? Graham: I was first introduced to the sport in 1966 (aged 6) by my father, and his involvement in the local club (Laleham Archery Club) and his interest in the sport fed through to me over time. For the first few years I probably did very little, just once a week or fortnight on a Friday evening when dad went shooting. Unlike my brother, who gave up aged 11, I continued to enjoy the sport and began to attend tournaments as a Junior, eventually also becoming a club committee member at 16. What appealed to you about judging? Why did you get into it? I just sort of fell into it. Both my Dad and my Uncle (Dad’s brother) were judges by the time I started judging, and, with a bit of knowledge around me, I found myself being asked to judge a local shoot (I queried this at first, as my Dad was also a G Potts (George) but the club said no, they wanted me). This was a local friendly shoot, and when I gave the assembly, I remember saying “We are shooting to my interpretation of the GNAS (now known as Archery GB) Rule Book – thus giving me a get-out if I got anything wrong! I’m not sure that at that time I saw any appeal in it, but as my own shooting was not great, it was an opportunity to still go to shoots and see all the people who had become friends without putting myself through the difficulty of having to shoot. How did you find the transition from archer to archery judge? Is it a case of gamekeeper turned poacher?! I have never seen it that way, although I can understand why it may be thought of like this. For me, it was more an opportunity to be really involved with all the people I knew through the sport. I do find that being an active archer (I continue to shoot, although not as much as I would like) it gives me some extra credibility with the archers, as I have been in their shoes (although not at their level for some). You judged at the London 2012 Olympics – how was that experience, both in an archery context and also the wider context of just being involved in such a huge and wonderful event? I’ve always been a big fan of the Olympics (probably first main recollection is of Munich 1972, although I probably didn’t really pick up on the archery at that time), so to be a part of the games was really special, and in London – where I work – was fantastic. I think many people have tried to explain what the experience was like (both athletes and officials) and it probably is difficult to put into words how we all felt. From an experience perspective, we had the opportunity to attend the opening ceremony, but within our event the necessity was to be “business as usual” and do the job as we always should do, although with the added attraction of a big crowd at the event, and a large television audience. It was also special to hear my name being cheered when announced as the Judge for a match – perhaps not the right thing to do, but it made me feel good! From an archery context, we know that the sport benefited hugely from the venue and excitement generated by the format, and a huge part of all this was the way in which the volunteers worked together doing their bit to bring it all together, led by a great team of people who had vision and skill to execute the plans. You head to Rio 2016 as chairman of the International Technical Team – that must be a real honour and terribly exciting? A huge honour and one of which I am terribly proud and excited about, but also humbled to think that I was chosen by others to have this honour of leading the team. We have completed the test event (September 2015) and are now looking forward to a great time in August, working with the organisers and most importantly the competitors to bring the archery event to life. The venue in Rio is iconic to the country and the city, and it is amazing to look up and see the statue of Christ the Redeemer looking down over the city – somewhat takes your breath away. Being the lead judge at such an event must come with a variety of different pressures – what do you feel is the most important aspect of your role? What are you mostly looking for? For me, there are two main aspects to my role as a judge generally – ensuring safety and ensuring fairness of competition. These will always underpin anything I want to do as a judge or as the chairman of the team. My task is really to ensure that the judges appointed as my team, and the supporting National Technical Officials, are given the environment and support to undertake their roles effectively and as required. Mistakes can happen – we are all human – and the need is to try and minimise the risks of this happening, but also be fully aware as to what to do should one occur, and deal with it such that no competitor is disadvantaged. Clearly appropriate application of the rules will help with this. You must have great faith in your own ability as a judge – would you say you’ve had a good day at the office if you go largely unnoticed? Not sure I do! I am always ensuring I keep up to date with rules etc, so that I can deal with any situation that comes my way – one of the big keys is how to handle issues outside of the normal rule interpretations, and I believe my relatively calm approach (although I do sometimes get a bit ratty!) helps me appraise the situation, and make an informed decision. To some extent a good day is to be largely unnoticed, but that can also mean nothing occurred to call upon you to make any decisions! Do you have to do much swotting up when it comes to rules and recent rule changes? Yes I do – as an international judge I have to reaccredit every four years, taking a very stiff test, while also answering questions during the cycle and attending necessary conferences. However, no complaints from me, as if I was shooting I would want the judges to be briefed and up to date on their knowledge. Just to attend an Olympic Games in Rio of all places must be extremely exciting – away from archery will you get a chance to take in some of the other events and experience the Games as a fan? Highly unlikely for me, as I will be working each evening to plan the following day match allocations for the judges, ensuring they have no conflicts of interest with the archers they are judging (i.e. not from the same country). That plus the possibility of needing to meet with the Sport Team, Technical Delegates and others mean I am likely to be quite busy. However, I do hope to go to the opening ceremony and, if time allows, I may well take in a sightseeing tour of the sights and sounds of Rio. 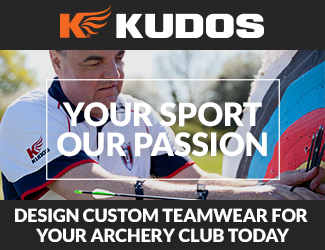 What’s the best thing about being an archery judge? On a broad scale it is always people – meeting and working with archers, coaches organisers etc, and catching up with all the people I have got to know over the many years – sadly of course this changes with some of those great friends having passed away, but there is always the opportunity to meet new people with like minded interest in the sport. From an international perspective, it is really the added enjoyment of visiting places I’ve never been to (I’m currently in Dubai where I am judging in the 2nd Fazza International Para Archery Championships, it seems almost unreal! ), although the view we get of the country can be limited to an airport, hotel and shooting ground! Thanks so much to Graham for taking the time out of his busy schedule to talk to us. We’ll be in touch with Graham as Rio edges closer and, with a bit of luck, Graham will be writing a guest blog from Rio while he is there. KUDOS is passionate about our commitment to supporting and encouraging people from all walks of life to get into sport at any level.